The Rasmussen Reports daily Presidential Tracking Poll for Friday shows that 43% of Likely U.S. Voters approve of President Trump’s job performance. Fifty-five percent (55%) disapprove. Scott Adams: The Turn to "Trump is Effective" is Happening EVERYWHERE! He's Star in China! One year ago, Rachel Maddow explains to snowflakes-in-waiting that Trump simply can’t win. I have included Maddow's meltdown from election night when Trump did INDEED win. of President Trump’s job performance. unprecedented in the first year of a presidency? Analysts predict economic boom for 2018! Crooked Hillary Clinton is the worst (and biggest) loser of all time. She just can’t stop, which is so good for the Republican Party. Hillary, get on with your life and give it another try in three years! Is she sincere this time? - I reckon I know who is lying ! Get Obama's daily job approval ratings. 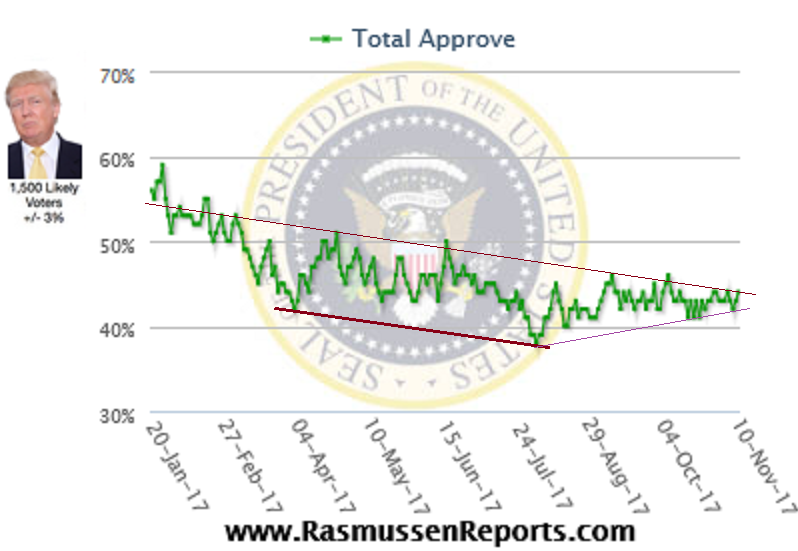 The Rasmussen Reports daily Presidential Tracking Poll for Friday shows that 44% of Likely U.S. Voters approve of President Trump’s job performance. Perhaps in part because of its failure to pass any major legislation, the Republican-led Congress earns its lowest job approval marks this year. Most voters are steadfast in their opinion that the more important job for Congress is passing good laws rather than stopping bad ones. Meanwhile, voters agree with President Trump that so-called “fake news” is a serious problem in America today. If a Fake News Trophy were to be awarded this year, the winners should be Fox News or CNN depending on which political party you’re in. - Wake up you (useful idiot?) Democrats! The latest Rasmussen Reports national telephone and online survey finds that 48% of Likely U.S. Voters think senior federal law enforcement officials broke the law in an effort to present Trump from winning last year’s election. Forty-one percent (41%) disagree. This includes 31% who say it’s Very Likely these senior officials broke the law and 23% who say it’s Not At All Likely. 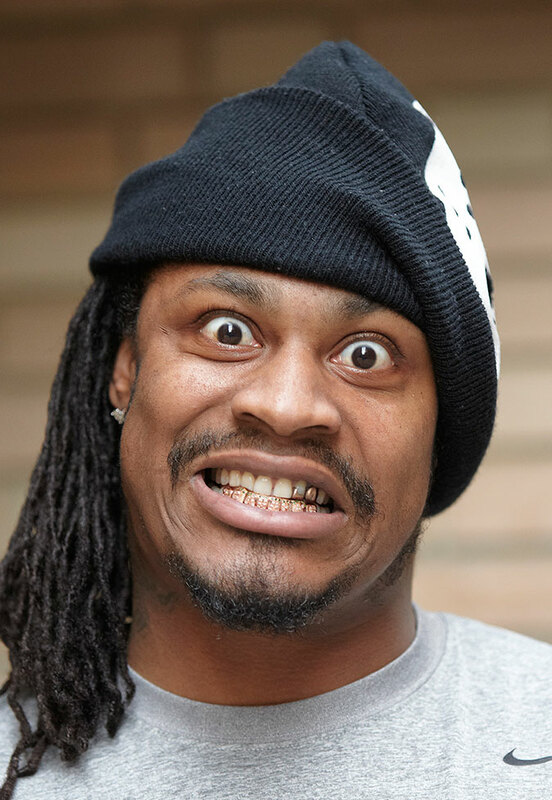 Eleven percent (11%) are undecided. Tracking Poll for Monday shows that 42% of Likely U.S. Voters approve of President Trump’s job performance. Fifty-five percent (55%) disapprove. Even a lot of Democrats are wondering if Hillary Clinton was really the choice of party voters last year following the release of a new tell-all book by Donna Brazile, former chairman of the Democratic National Committee. Among all likely voters, just 32% now think Clinton won her party’s nomination fairly. Forty-seven percent (47%) say the Democrats’ electoral system was rigged against Sanders. Twenty-one percent (21%) are not sure. 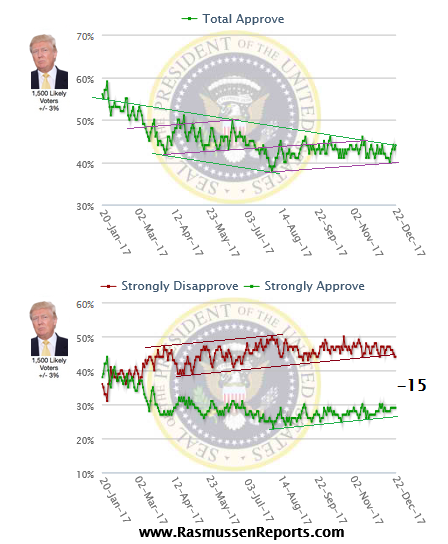 The latest figures include 29% who Strongly Approve of the way the president is performing and 44% who Strongly Disapprove. This gives him a Presidential Approval Index rating of -15. (see trends). The Republican-controlled Congress under prodding from the president has passed the biggest reform of the U.S. tax code in decades. It includes across-the-board tax cuts for most Americans. Most Republicans (66%) and 50% of voters not affiliated with either major party think tax cuts help the economy. Just 22% of Democrats agree. Voters are feeling optimistic again about the country’s future. By comparison, Obama’s coverage was 42 percent positive. It’s safe to say that the current president, for all his temperamental flaws and petty insecurities, makes his tightly wound predecessor, Barack Obama, look like a raving madman when it comes to showing sense on economic growth. 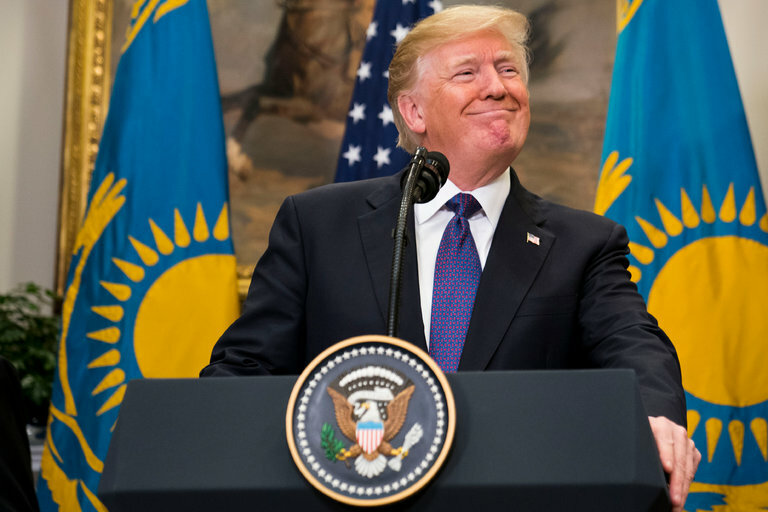 Armchair psychiatrists are having a field day diagnosing the president’s mental state from afar, especially after his increasingly bizarre tweeting, but the market says otherwise. WASHINGTON — President Trump’s physician said Tuesday that the president received a perfect score on a cognitive test designed to screen for neurological impairment, which the military doctor said was evidence that Mr. Trump does not suffer from mental issues that prevent him from functioning in office. The president’s doctor said Mr. Trump’s overall health was “excellent,” with mostly normal results on a battery of tests and examinations. He said Mr. Trump, who is almost 72, has remarkably good cardiac health, probably because he does not smoke or drink alcohol.